There is absolutely no denying that digital technologies are disrupting all industries, businesses and its workforce including the end customer. Digital transformation is not only important but now there is a very real and urgent need to implement it so that the business stays relevant, profitable and competitive. As a leader of your organisation, you will need to identify the areas within your organisation where new technologies can be leveraged to fundamentally change, how much of the daily tasks and processes can be automated. But will the implementation of new digital technologies transform your business? The big answer is — NO. Let’s take a step back and see holistically see, what has gone wrong here. Businesses run by offering products & solutions to the end consumer, and the end consumer is leveraging the digital mediums — whether its mobile, AI devices, Amazon Alexa, Google Home, etc and is demanding more & more in this new hyper-connected world which is changing by the second. So, as the consumer expectations evolve and changes, so will the businesses have to adapt and be agile in their product and solution offerings. Implementation of Digital Technologies is easy as there is a lot of help and support available through the consulting companies, but how do you change/adapt your organisation so that it is adapting and is agile to the consumer expectations, is where the need comes for “Cultural Transformation”. How can you change the culture of an organisation, so that the entire organisation is enabled & agile to the changing consumer behaviour and is automatically adapting new digital tools and technologies to save costs and deliver more value or creating more innovative product and solution offerings? An Organisations culture can be the single, most important factor in determining its continued success. Every organisation has its own culture, its DNA, crafted by behaviours and values that define how work is done and how people embrace change. An organisation’s culture is shaped by both its formal and informal rules of engagement. How can you enable each employee in the organisation to become a cultural change agent? Cultural transformation begins with the personal transformation of its leaders. Organisations don’t transform. People do. So, how can you enable both the leaders/middle management and each every employee to change the way in which they think and do work, approach and solve problems? Leaders lead by example, by first training themselves by adopting the new ways of working and encouraging their team members to further encourage and follow within their teams. Cultural change is expedited by using a leader-led learning approach. Culture change is further accelerated by connecting individual beliefs to organisational results. Leaders enforce transparency at all levels, by sharing the targets and results continuously, and help drive the belonging-less across all teams of their contributions to the overall results. A leader needs to encourage collaboration within teams. All the latest technologies, Artificial Intelligence, Robotics, IOT, Big Data, Blockchain, Machine Learning can only be leveraged, adopted and integrated into the systems and processes of the organisation if different divisions within the organisation collaborate with each other effectively and meaningfully. By encouraging collaboration, you implicitly create a culture of innovation and creativity across the teams. Leaders ensure the organisational transformation is measured and communicated continuously across the teams, be agile throughout and adapt based on feedback continuously. 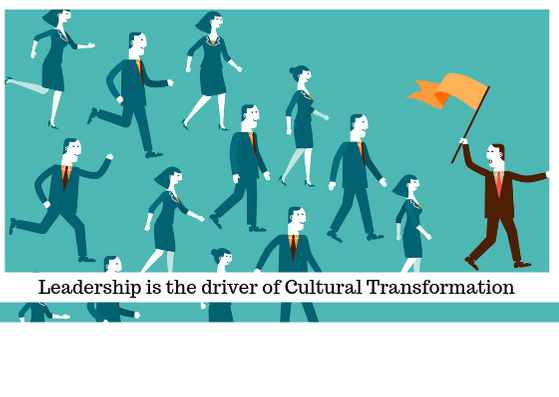 Driving successful cultural transformation in an organisation requires the vision, guidance & adoption of its leaders. The above sequence will enforce the significance of the leadership in the adoption of digital transformation leveraging cultural transformation within the organisation. Just to call out here, leadership does not mean only the B/C/D community within the organisation, but leaders across all tiers within the organisation.